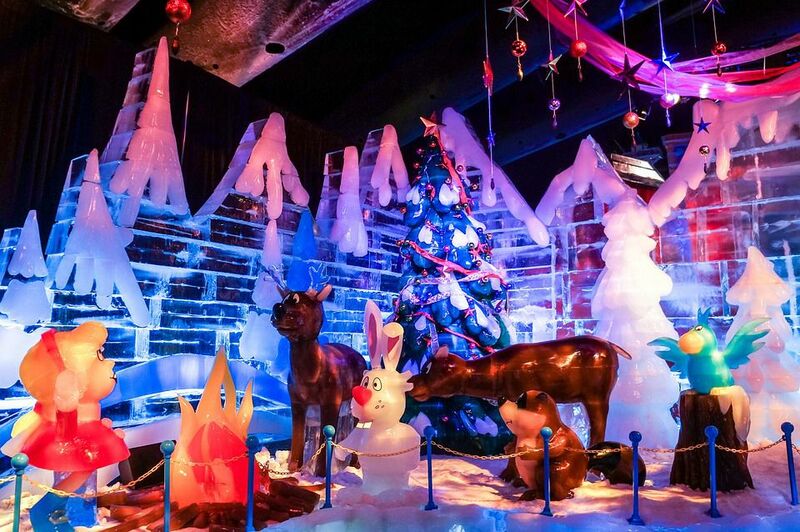 Two million pounds of ice are transformed into every imaginable Christmas symbol at Marriott's Gaylord Palms Resort in Kissimmee, Florida. Yes, ice in Florida—36 truckloads, to be exact. Beginning in November and continuing into the first week of January, ICE is a star attraction of the Florida holiday season. For the 2018 - 2019 season ICE will feature the classic holiday movie, A Christmas Story. The dates are November 16, 2018, through January 6, 2019. This winter-season event features tons of ice sculptures that have been hand-carved by artists from Harbin, China, and depict scenes of holiday celebrations from around the world. The shaped, cut, illuminated, and often colored ice takes over a large portion of the resort's convention center. To give you an idea of the size and scope of the attraction, it boasts 1,500 fluorescent tubing lights frozen within three different types of ice: clear glass-like crystal ice; white snow-pack-like ice, and colored ice. During your walking tour, you are surrounded by ice sculptures depicting characters and scenes from the holiday season crafted into a series of themed areas. Even though this is sunny Florida, come prepared for being in a chilly 9-degree Fahrenheit environment. All guests are provided with calf-length, hooded winter coats in all sizes to fit everyone from infants to large adults. Visitors are required to wear long pants and closed-toe shoes (no flip-flops). Hats and gloves are recommended for your comfort and are available for purchase. The self-guided, walk-through tour of ICE begins with a short five-minute video that explains how the ICE show came to America and how it is assembled each year. The video explains what it takes to make these intricate creations and how they are preserved to survive in Florida's temperate climate. Then you'll actually walk on a bridge that is made completely of ice and is large enough to hold five to 10 people. Perhaps the most dramatic and powerful ice sculpture is the crystal-clear, life-sized replica of the Nativity scene. There's also an elaborately set dining room scene created completely of ice with no detail spared, including the family cat. The kids can have their photo taken with the 10-foot-tall ice sculpture Santa Claus, complete with his red suit made of ice. The highlight of the day will be the ice slides. That's right, youngsters and the young-at-heart can glide down five large ice slides. There's no sled required—you just sit on your parka, fold your hands across your chest, and go. Children must be able to walk up the stairs on their own in order to ride the slide. And, everyone can zoom down a snow-covered hill on inner tubes. Double riding tubes are available for parents with small children 36 inches or taller. If you are lucky, you may see one of the artisans working on a sculpture at the Frostbite Factory, the carving zone that showcases the artisans live. If you have a special event such as a birthday, Gender Reveal Party, plan to propose marriage, and more—you can request special arrangements for your event. If you want the special VIP experience, that can be arranged too. ICE holiday guides provide special perks like skip-the-line, VIP seating and a private demonstration with the ice carvers. While at the resort, be sure and see the Cirque Dreams Unwrapped Stage Show. Although tickets can be bought at the door, it's highly recommended that you purchase them online in advance to guarantee admission at the time you want. They are nonrefundable but may be exchanged for another day or time slot. Several different combination tickets are available, such as ICE plus snow tubing, Play and Save, and unlimited-access passes. Parking is available for a fee. You can stay overnight with special ICE package deals. Overnight guests can schedule their ICE visit during the Extra Cool Hour daily from 9 - 10 a.m. There are military and AAA discounts for guests staying at the resort. Florida residents enjoy discount prices on tickets for ICE.